Change Islands is an outport community in the Canadian province of Newfoundland and Labrador. 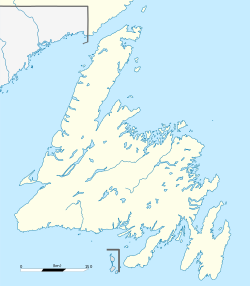 The community spans two small islands of the same name which lie off the northeast coast of the island of Newfoundland between Notre Dame Bay and the Labrador Sea. The community of Change Islands is located primarily on the larger South Island, today hosting approximately 200 residents, though most of the public buildings are on the North Island. The southern and northern Change Islands are separated by a "tickle" (a narrow strait, in Newfoundland English). The South Island is larger, containing more marshes/bogs, and wooded area, the North Island is smaller, mostly barren. It is located in Notre Dame Bay, on the northeast coast of the island of Newfoundland. The community was first established as a series of random settlements around the islands tied to seasonal fishing activity which developed into a cohesive community. The first European settlers arrived sometime in the mid-18th century to fish. The residents of Change Islands have preserved many of their traditional homes, stages, and stores (fishing sheds); many of these landmarks are disappearing in much of coastal Newfoundland and Labrador with the collapse of the ground fishery. There are a few accommodation facilities on the islands, which are accessible by the MV Veteran, the provincially operated ferry from Farewell that also services Fogo Island further to the east. Artist Gerald Squires was born in Change Islands. This page was last edited on 20 July 2018, at 23:51 (UTC).